Bowman Riley designed a contemporary new employment space for developer Candelisa, The Motor Works, as part of a wider mixed-use development to renovate a historic mill complex and six-acre brownfield site in the village of Cononley, North Yorkshire. Subsequently, we were commissioned to design the 1500m2 interiors on behalf of the new building owners, Nilorn, a leading fashion label specialist. Nilorn is currently leasing office and factory space in Keighley with plans to move into their new premises in early 2019. 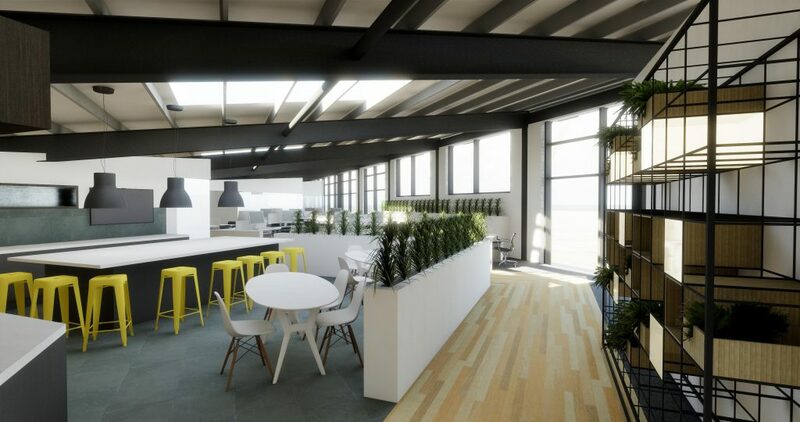 Our brief is to realise Nilorn’s clear vision to create a unique contemporary office space and bespoke facilities for the production side of their business. Staff wellbeing and increased efficiency are at the heart of their aspirations. A Scandinavian-inspired interior concept has been partnered with a Yorkshire industrial aesthetic to reflect the company’s Swedish roots and the site’s heritage. The designs provide spacious, flexible open plan office space with a layout that has been carefully coordinated to ensure the wellbeing of the staff. Facilities include high-quality showers and washrooms, cloakrooms, ample storage, an open plan coffee bar and catering standard kitchen for events. Following an analysis of their existing factory facilities, the new production space has been carefully laid out to increase efficiency. Working closely with our client, we examined the work-flow of the production from printing and packaging to distribution and devised the most efficient layout to reduce distances between tasks.